1 Rinse parsley, basil and mint, shake dry, pluck leaves and chop finely. In a small bowl, mix herbs with yogurt and the sea salt. 2 Line a fine-mesh sieve with a clean kitchen towel or cheesecloth. Place sieve over a bowl, pour yogurt mixture into sieve and fold edges of towel over the top. Cover with a heavy plate. Let drain in the refrigerator for at least 24 hours (or up to 36-48 hours). 3 When yogurt cheese is ready, drain artichokes and cut into quarters. Rinse tomatoes, drain and halve. 4 Coarsely chop olives. Peel red onion and finely chop. 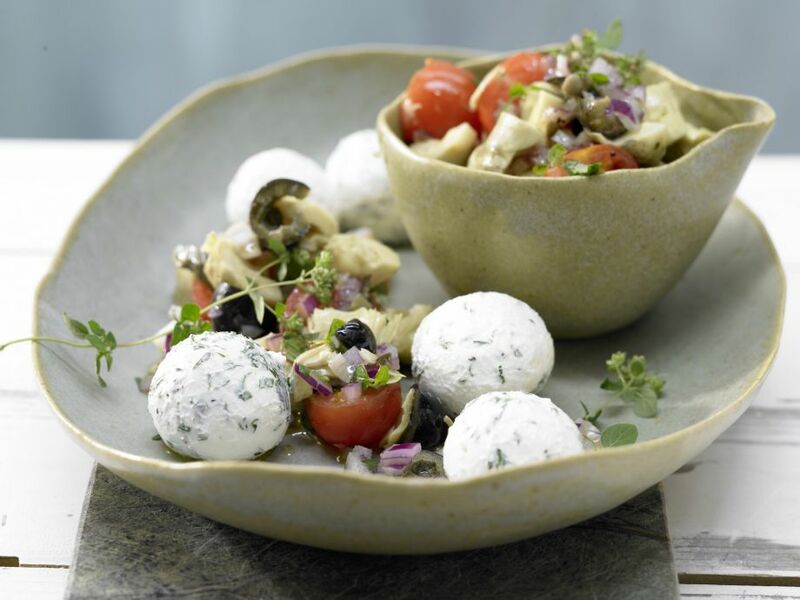 In a bowl, combine artichokes, tomatoes, olives and red onion. 5 Add olive oil and orange juice to onion mixture, season with salt and pepper and toss to combine. Refrigerate for at least 1 hour to allow flavors to develop. Rinse oregano and shake dry. 6 Remove cheese from the lined sieve. With moistened hands, form the yogurt cheese into small balls. Season with pepper, garnish with oregano and serve salad on the side.